The growth of business and population in Dallas and the surrounding area has prompted some groups to propose solutions to issues such as traffic congestion. One proposal in particular is the Trinity Toll Road. The proposed toll road would spend over a billion dollars for a nine mile stretch of road. Taking over a billion dollars and investing it into current infrastructure would help create better transportation options. Throughout parts of Dallas, new developments are popping up to help create more urban living spaces. Creating new places to live within Dallas is a solution that helps breathe new life into areas and bring people closer to their places of work. 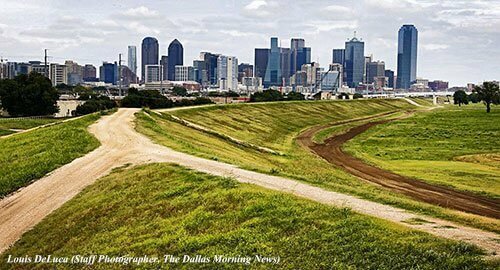 Finding alternative means to help Dallas and surrounding areas grow will help prevent unnecessary projects that create environmental hazards, negatively impact property values, and waste dollars needed for other areas. As a business in an area that would be directly affected, we feel strongly about NOT having the Trinity Toll Road constructed. Intruding upon an area of Dallas that is finding itself in the middle of huge growth by individuals and small business owners would hinder greater growth in the future and turn areas of Dallas into dangerous and uninviting places. Click here to download a template letter you can send to your elected representatives. Expressing your concerns about the Trinity Toll Road will help them understand the negative impact such a project will have on the beautiful place we live and work. Letters/emails and calls should be directed to the elected officials. After you send your letter/email or make a call, please let us know you have done so by emailing coy@chadwestlaw.com. Together we can stop the Trinity Toll Road and keep Dallas beautiful. Download the Trinity Toll Road Form Letter that you can send to your elected officials!